Our product range includes a wide range of ms connector. The standard MS Connector range was originally developed over 50 years ago for the Military forces. They have since been used in various military, industrial and commercial applications. They are designed to meet the operating requirements of MIL-C-5015 Military specifications. 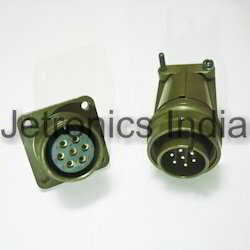 They also meet the operating requirements of Joint Service Specifications JSS50812 of the Indian Defense Services. Looking for MS Connectors ?